An army fit for a king with an extraordinary history to boot. 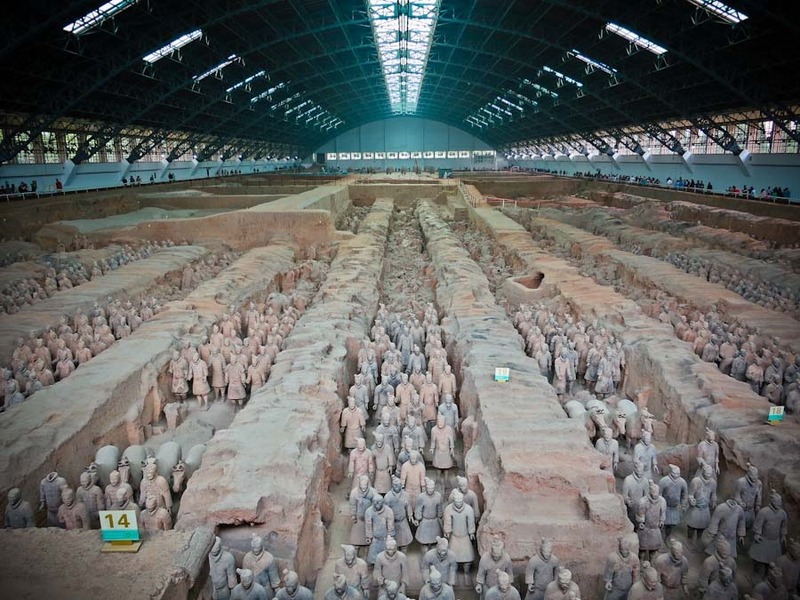 No visit to China would be complete for us if we didn’t make the journey to Xi’an to visit one of history’s greatest discoveries. 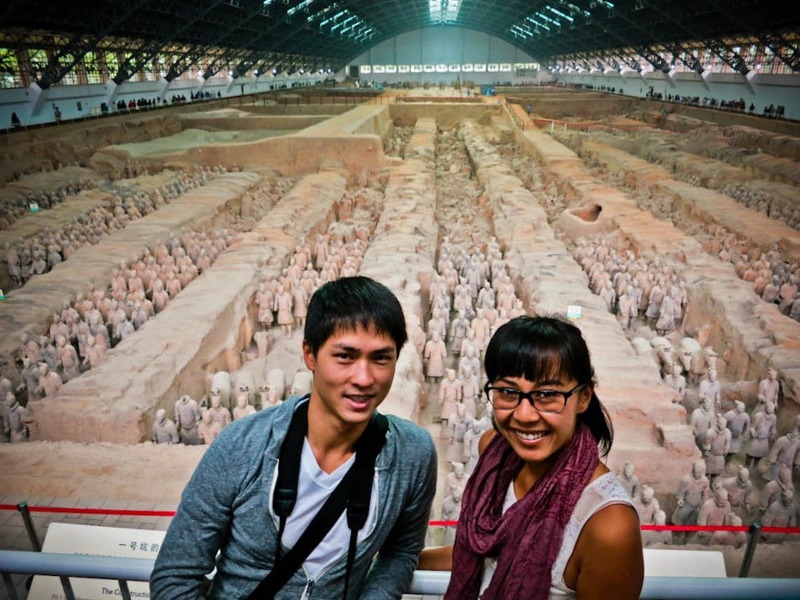 In fact, I was secretly more excited to see the Terracotta Warrior Museum then the Great Wall itself, but just slightly. The site in itself is magnificent. But it’s the extraordinary history behind it all that has us captivated. The site was discovered in 1974 by a group of farmers attempting to dig a well. 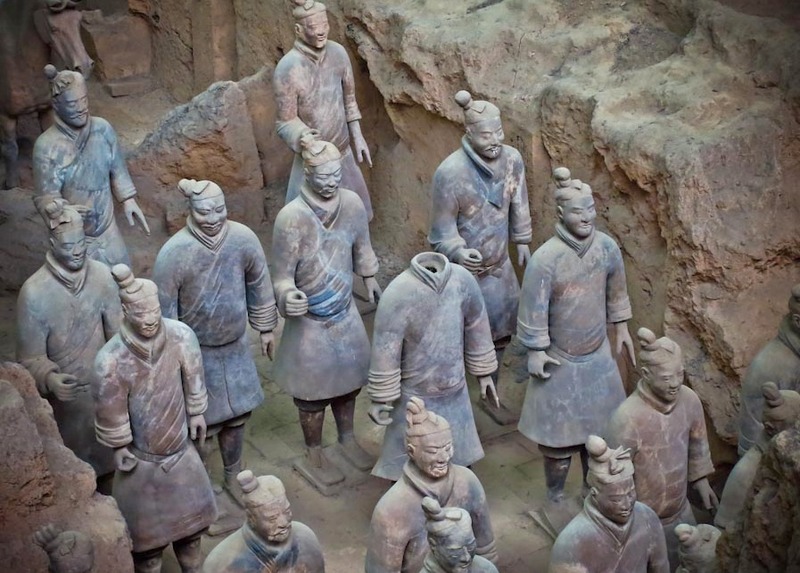 Nearly 2,200 years later, the warriors have, quite literally, stood the test of time. 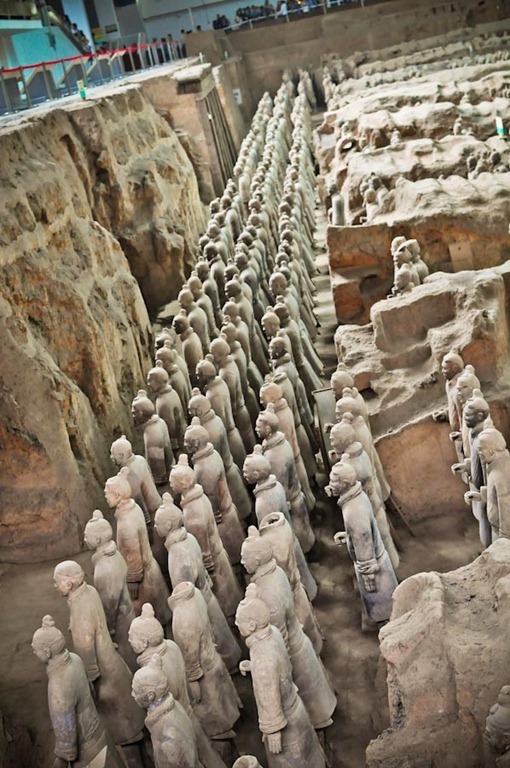 In the 3rd century BC, the first Emperor of China, Qin Shi Huang Di, commissioned a thousand artisans to build him an army as well as an entertainment sight to keep him protected and amused in his afterlife. It is estimated the army consists of approximately 8,000 soldiers of different ranks from archers to infantrymen to generals, about 800 horses, 130 chariots, a band of musicians, acrobats and bureaucrats. So far, only just over 1,000 soldiers are on display. 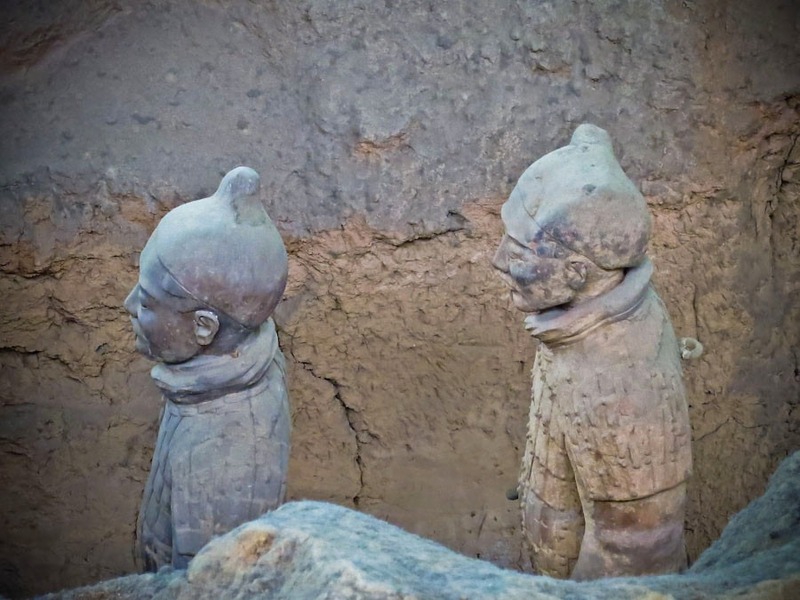 Each terracotta warrior is unique – built with a sense of realism from the individualized details of the face (ears, nose and other facial features) to their hair style on the back of their head, including wardrobe to associate with different rankings. It’s thought that Qin’s enemies, kingdoms he had conquered lay east of his own, therefore his army is all facing to the East. When the soldier were originally made, they were brightly colored – vibrant green and red and blue. 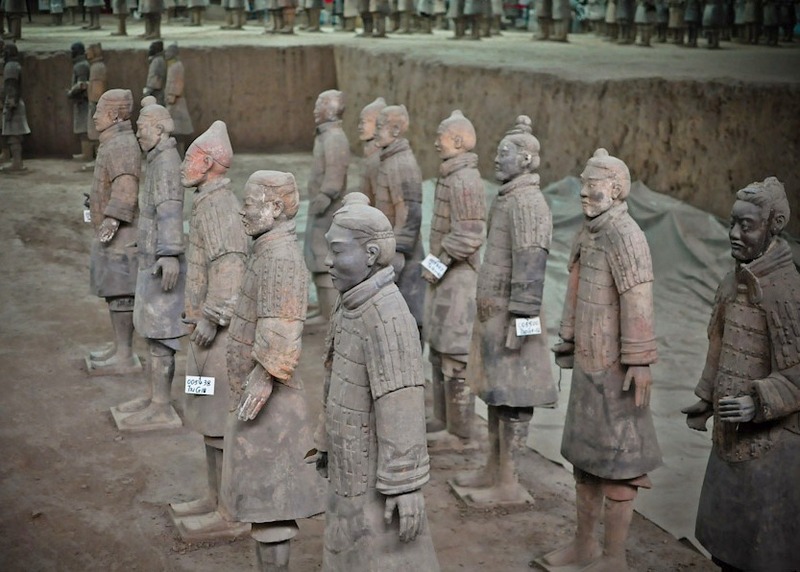 Unfortunately, the current terracotta warriors on display have since oxidized dull and grey when exposed to air. Archaeologists are now taking their sweet time excavating Pit 3 in order to preserve the original vivid colors. 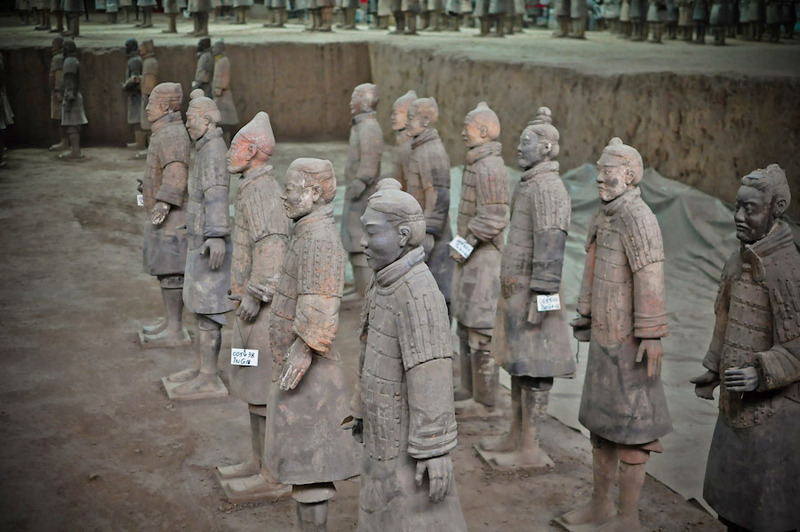 Over 10,000 bronzed weapons have been excavated including swords, spears, arrowheads and crossbows. 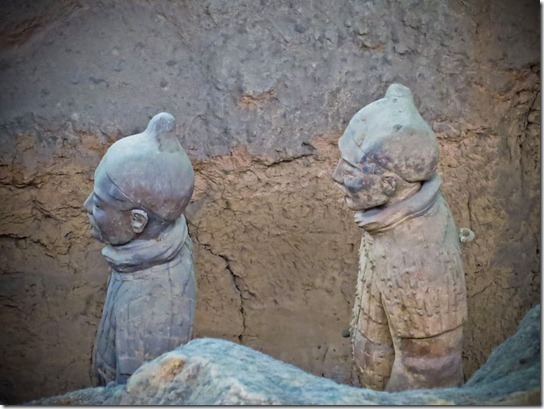 Most of the original weapons were thought to have been looted or have rotted away. Some are displayed in Pit 2’s exhibition room. 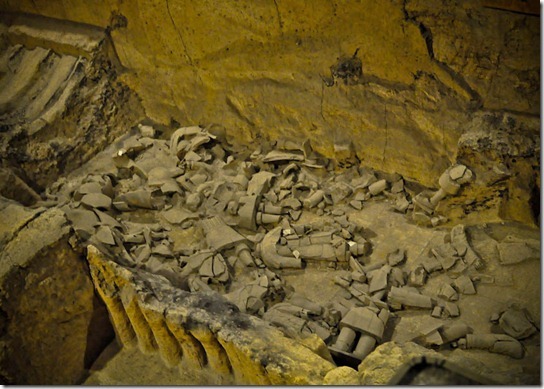 To date, three underground pits have been discovered and excavated. 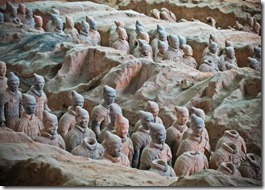 Pit 1 holds the vast army in typical battle formation. 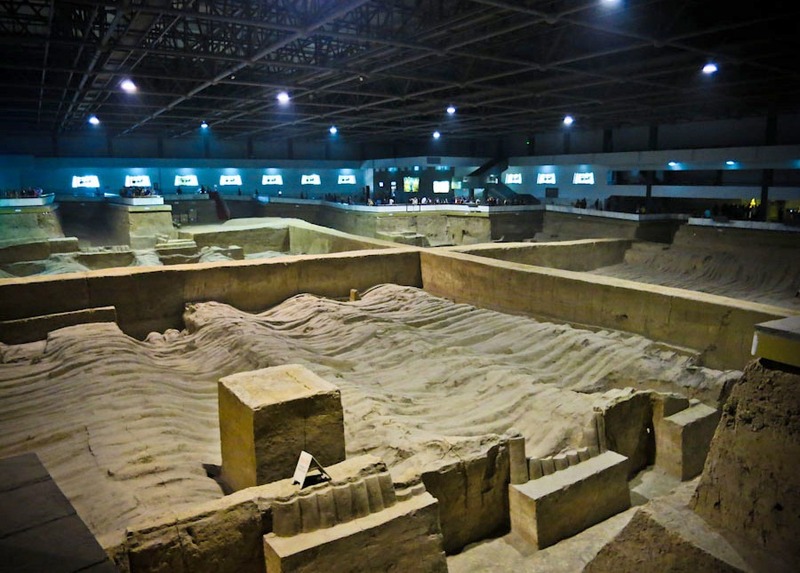 Pits 2 and 3 are smaller containing warriors, carts and horses along with exhibition rooms displaying artifacts extracted from the surrounding sites. Both Pits are dimly lit as it is under slow excavation. 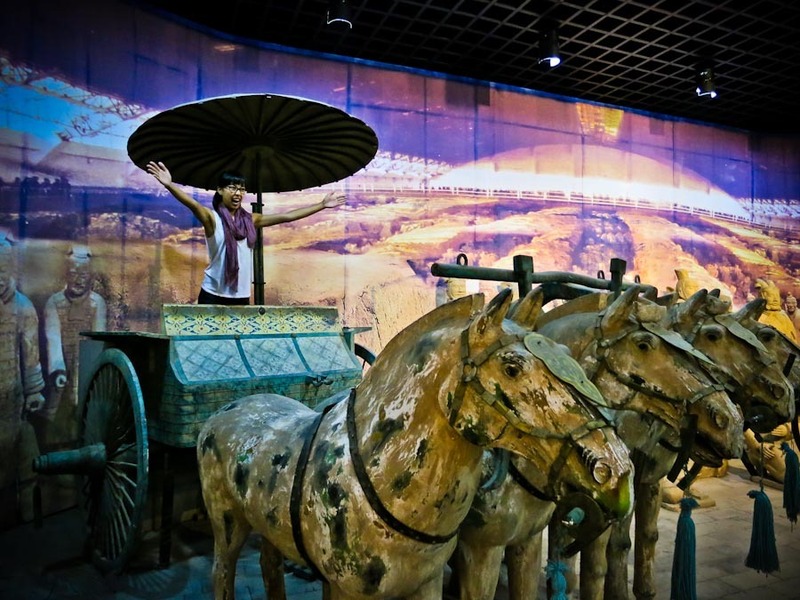 Aside from exhibition rooms showcasing artifacts from the Pits, you can take photos with replica terracotta warriors including fake chariot, horse, costume and all. For a small fee of course. Having now seen it with my own eyes, it’s right there (maybe even tops the list) with the Great Pyramids of Giza and the ancient city of Ephesus as one of the most amazing sites I’ve ever had the privilege to witness in my lifetime. Planning a visit yourself? 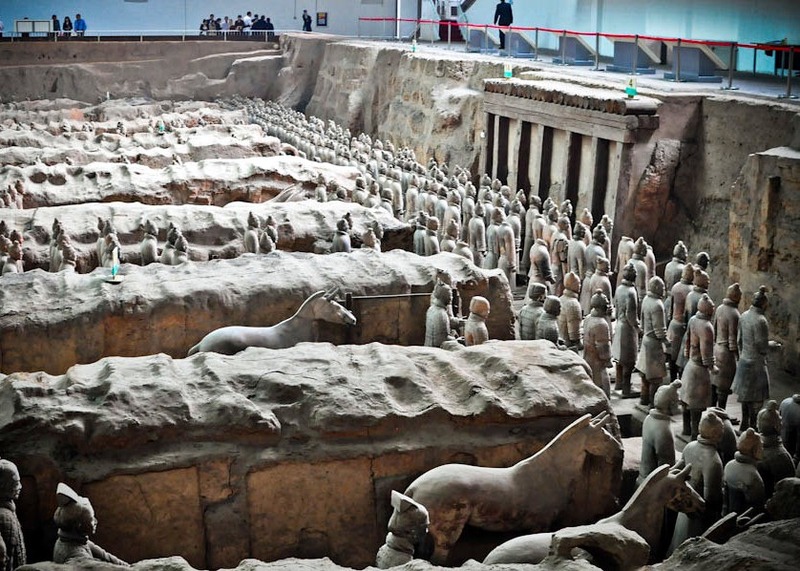 Here are a few..
To get from Xi’an to the Terracotta Warriors, take the 5 (306) bus located at the bus parking lot in the east square of the Xian Railway Station. 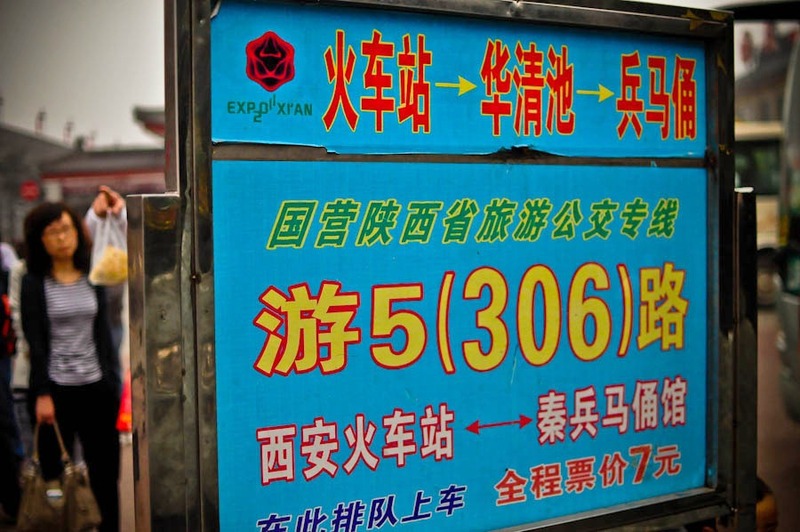 The ride should cost 7 RMB 1-way. Money is collected on the bus. Exact chance preferred. 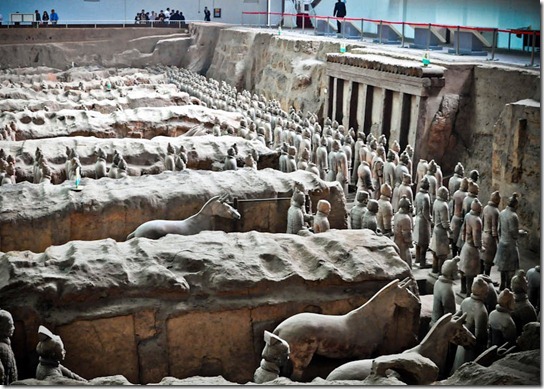 The Terracotta Warriors is the last stop and should take approximate 1 hour. There are a lot of “fake” public buses so be sure to look for the right #5-306 bus. There will usually be multiple buses lined up, a long queue and a sign posted. There is an outdoor food court on site. Reasonably priced and good. 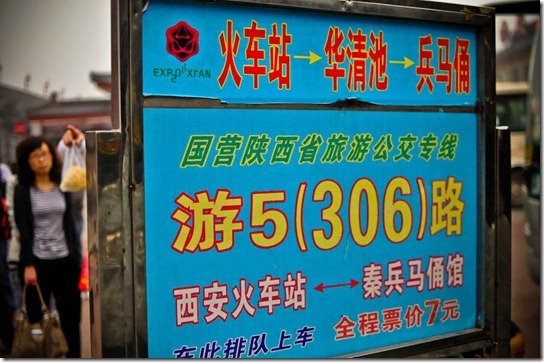 Entrance fee is 150 RMB. 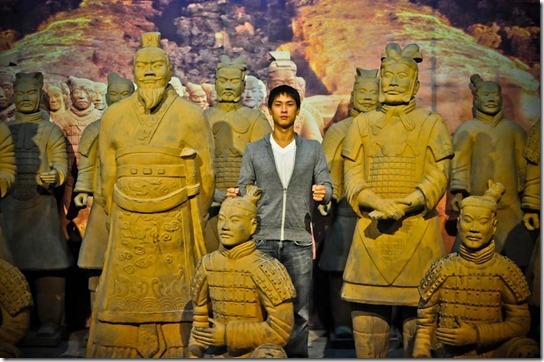 Cheesy photo booths with a mini terracotta army is available for 10 RMB per photo/ person. Bring a zoom lens if you wish to get decent photos of the army. Clear your schedule and give yourself plenty of time. 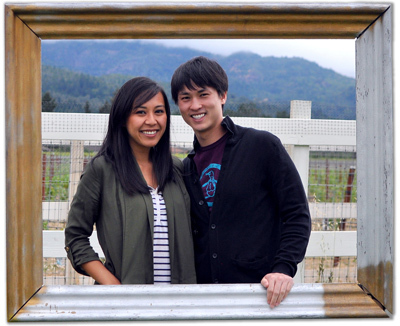 It took us a leisure 3 hours to visit all major sites. The place is massive! 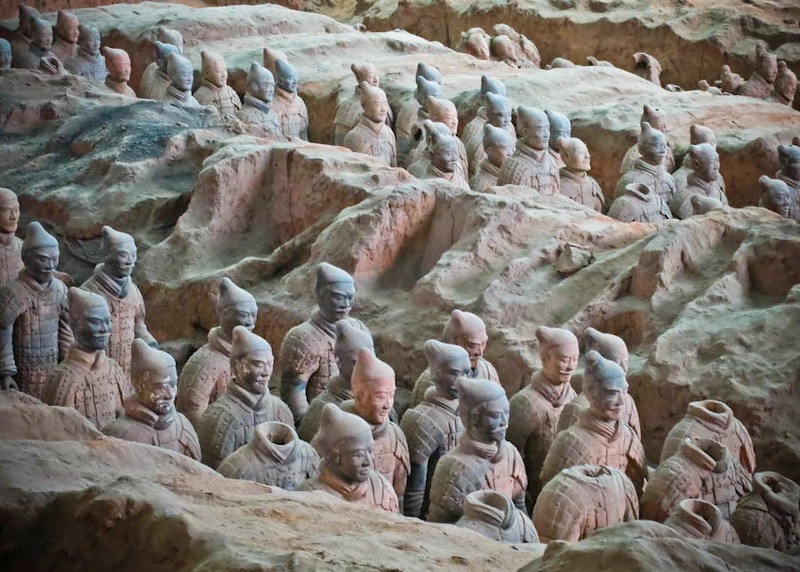 Is Terracotta Warriors on your bucket list? What an extensive informational post, nice work! 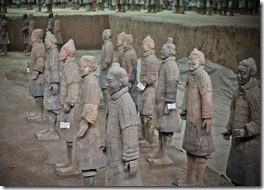 I have to admit I was much more impressed with the Terra Cotta warriors than I thought I’d be. Walking into that main room for the first time, seeing the thousands of warriors — it was quite literally awe-some. Thanks Edna! I know what you mean. I didn’t think I’d be THAT impressed myself until I walked into Pit 1 and was like.. whoa! Ahh thanks Maddie. Are you planning a visit soon? You’re going to love it! I love the photos but wow it seems so eerie. Now that you mentioned it, it does kind of seem eerie. I’d hate to be locked in at night. That would be creepy..
Definitely on my bucket list! Fascinating history and your post made me want to go even more. It really is an amazing site. Hopefully one day we’ll be able to see their original colours- a good excuse to return! Loved your photos and information. I’m glad the Chinese are taking their sweet time. Really hope they can preserve some of the original colors. I’d definitely go back for that. 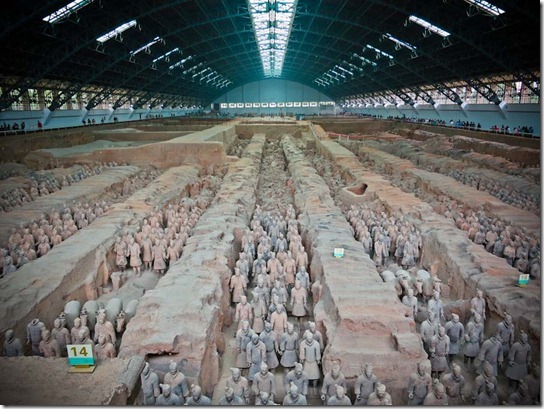 I went to see them last year on my own in Xi’an. its was incredible! 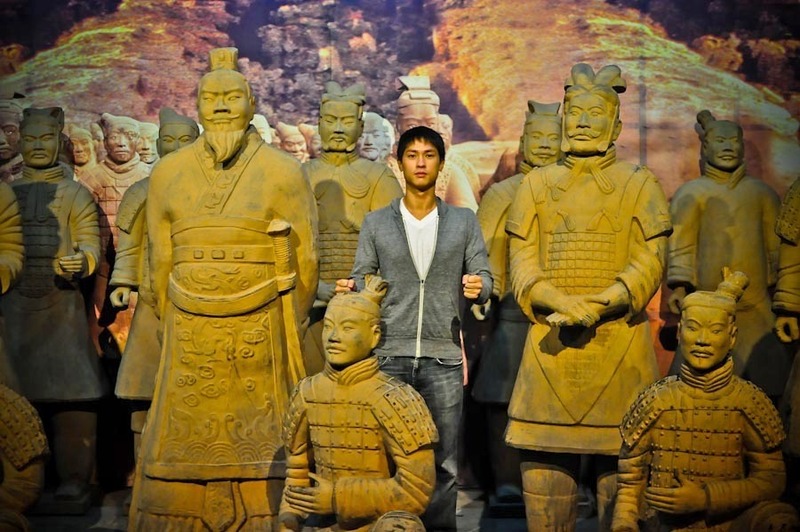 i did find Xian an interesting place, I had it in my head that the warriors were going to be in the countryside and the whole place would be quite mysterious. I got a surprise when I arrived in Xi’an and took the public but to the warriors 🙂 I did stay in a great hostel near the centre called Xiangzimen International Youth Hostel def gets the thumbs up i really liked it! 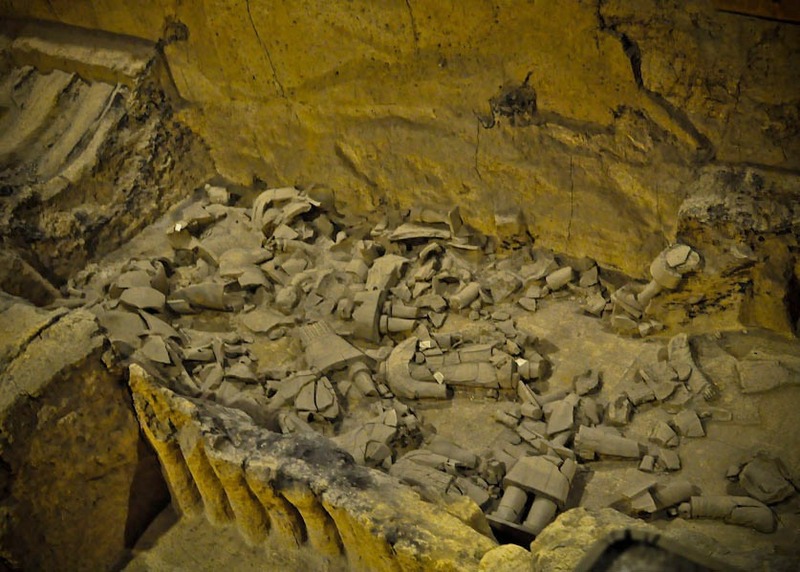 Did you get the chance to see the museum where they show pictures of the site before they dug it up? It was very much all countryside and definitely mysterious. 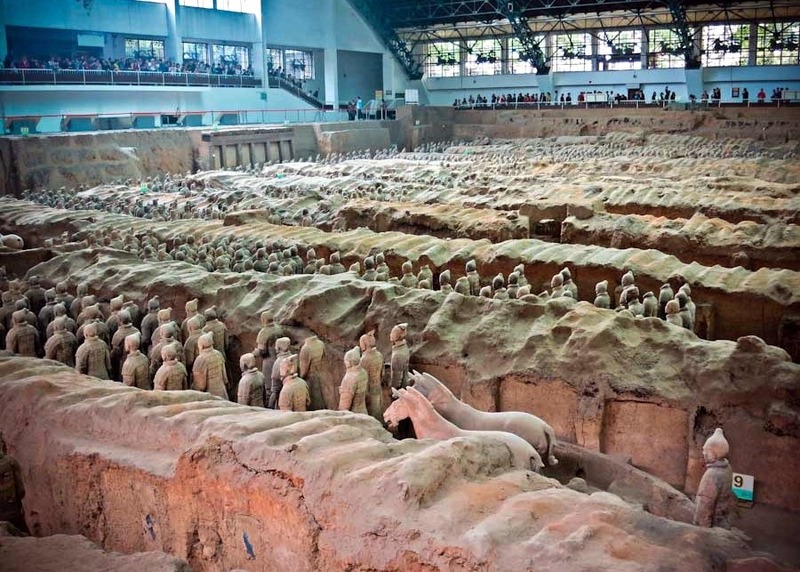 I loved Xian in general but particularly the Terracotta Warriors. The craftsmanship was amazing! I would have loved to have seen the original when they were painted in army colours. I’m with you. I try to imagine seeing the 8,000 or so warriors all decked out in bright shades of red and green and purple. I’d imagine it would have looked more life-like and even more impressive. Hoping they can preserve some bit of that in Pit 3. I went to see the warriors in 2006 for my honeymoon and I walked around with my mouth open the entire time. The site was so amazing and I couldn’t believe that the pits we saw were only a tiny percentage of what is still yet to be discovered. It should definitely be on everybody’s bucket list in my opinion. I was jumping up and down! Haha. 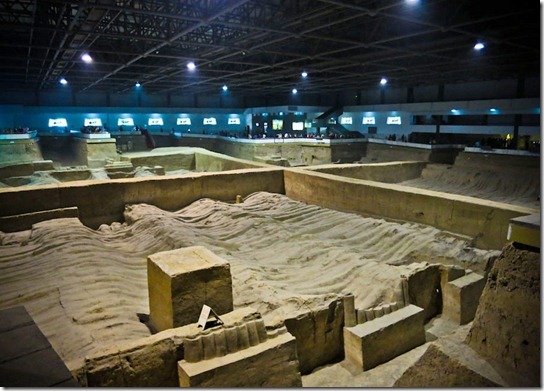 There is still so much to be uncovered including the Emperor’s tomb! They say it’s booby trap.. eeek! I wonder how much we’ll get to see 5.. 10 years from now. love! i didn’t know much about the terracotta warriors until i start working in my current office, and we have two replicas “protecting” our floor, both named alex. i’ve been there alone with them, and they creep me out. we had three, but one’s head fell off (also named alex) during a cleaning spree and we can’t get it replaced. Its been on my list for years too. Truly a remarkable site and so much still left to discover. Thanks for trippin by! The warriors are definetly in my bucket list. I have been to China but only to Shanghai. There is still so much of the country to see. All you photos look amazing. I’m interested to see what it’ll look like in a few years.. The new uncovered stuff. Hey, a couple of those soldiers retained colors and look VERY real! 🙂 I went 10 yrs ago and was equally impressed with the history and the detailed work. I am very glad they are conscious now of the damage unearthing them causes and hope they don’t unearth all so future generations may benefit from more technology developments that may preserve their original color! Truly amazing, both the site and the history behind the warriors… Great photographs. Wow, absolutely amazing! 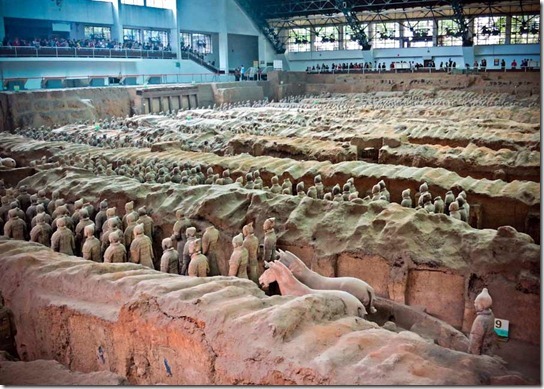 I can’t even fathom the thousands of “warriors” that were created and later unearthed. I honestly didn’t know anything about these Terracotta Warriors before reading this – thanks for the introduction! Neither did I before coming to Xian. I downloaded a great history podcast before arriving. 😀 thanks for trippin’ by! What a stunning archeological find. I definitely would love to check this out sometime. I was in China last 2010 and sadly, I haven’t had the chance to see this; though one of the reasons I will come back. 🙂 Thanks for this post. it is helpful esp with the one on the right bus to take. This is so spectacular, I do so hope to see it for myself someday, the feeling when you walk in and see the enormity of it must be fantastic!